I come from a family of cake eaters – we love any form of it. But sheet cakes are always a big win because they are so easy to make and you can get creative with them. 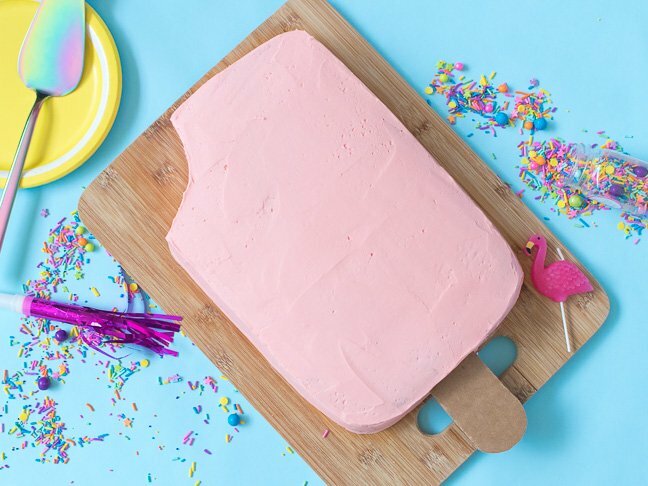 I recently discovered this popsicle sheet cake and it’s my new favorite. Whatever occasion you’re celebrating this season – whether its a birthday, graduation, or just your average weekend BBQ – this simple popsicle sheet cake is the perfect dessert! Simply bake your favorite cake recipe (my sheet cake recipe is below) in a large rectangular pan, and you already have the perfect foundation for a popsicle shaped cake. 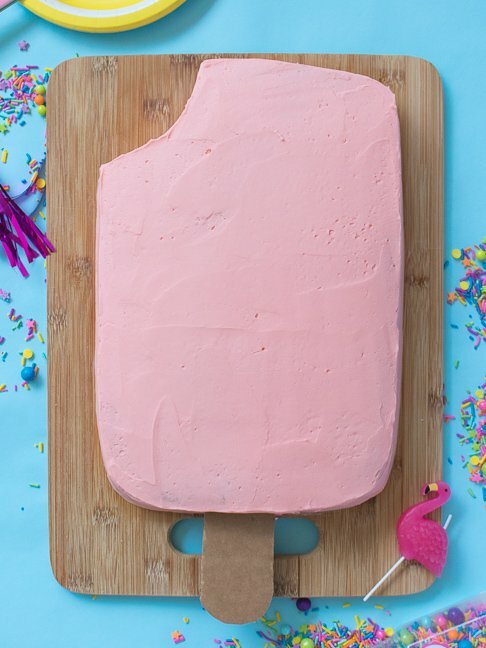 Layer it, frost it with colored frosting and add a cardboard popsicle stick! 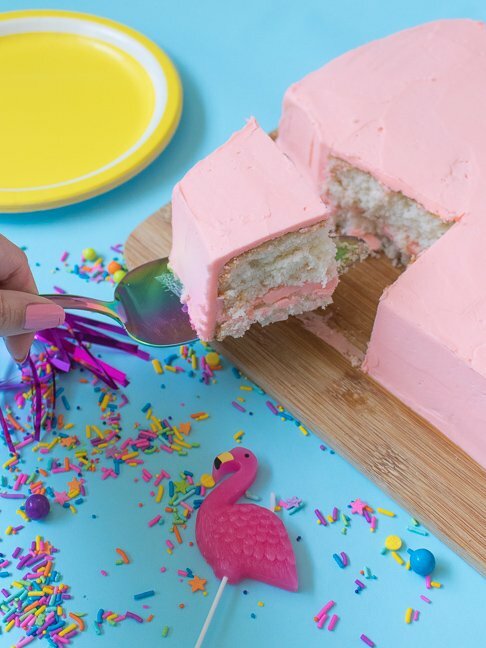 It’s the easiest cake decorating project for your summer parties, and pairs perfectly with a scoop of ice cream or a dose of sprinkles. The one-layered cake often comes with a thick layer of frosting on top, too. It’s a no-fuss, no-frills dessert that easily feeds a crowd. While it makes sense for big celebrations, it’s a good choice for smaller ones too ― because sometimes leftover cake can taste even better the next day! 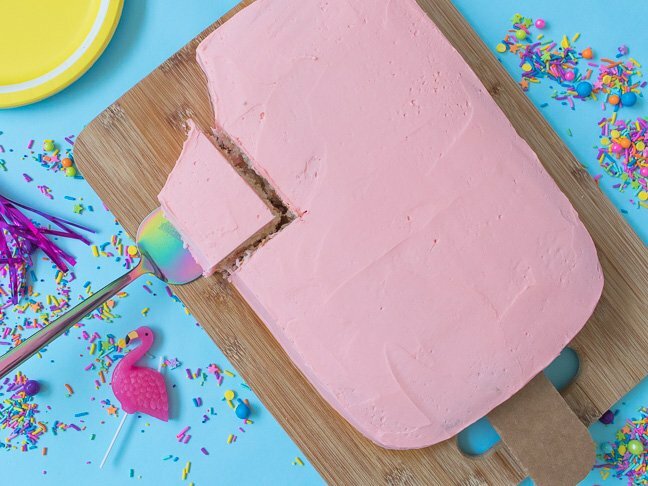 Follow along with this step-by-step tutorial and learn how to make this popsicle sheet cake just in time for summer. Step 1: Remove cooled 9×13 inch cake from pan. Carefully move the cake to a large cake board or a cutting board. Step 2: Mix food coloring into the frosting and stir until desired popsicle color is reached. Step 3: If desired, level the cake into two layers and fill with vanilla frosting (optional). Step 4: Use a knife to cut a curve out of one corner of the cake to make it appear like a bite has been taken out. Step 5: Cover the entire cake with a thin layer of frosting, or a crumb coat. Refrigerate at least 30 minutes. Step 6: Apply another thick layer of frosting to the cake, smoothing along the top and sides with the spatula. Step 7: Cut a strip of cardboard about 2×5 inches with one end curved. Insert the straight end into the uncut end of the cake to resemble a popsicle stick. Preheat the oven 350 degrees F. Spray a 9x13 in baking pan with cooking spray and set aside. In the bowl of your mixer, beat the butter until light and fluffy, about 2 minutes. Add the dry ingredients and mix until crumbly. Scrape the bowl as needed. Let cool for 30 minutes before carefully removing from the pan. Let cool completely before frosting. Add the vanilla and continue beating for another minute until the frosting is smooth and fluffy. Mix in food coloring until desired color is reached.